***Kleenex alert. Sorry- this is another Kleenex alert week. This week's theme is “Tough woman”. I struggled to choose an ancestor. Not because I had no choices but because I had many. I am so fortunate to come from a long line of very strong women. I decided to write about my paternal great-grandmother, Edith Cleo HUBBARD DRAKE, since my initial post this year was on my mom's side. When I knew Edith, she was old (at least to me as a child- she seemed very old). She was very quiet and very sweet. I never knew her to hurt anyone although I'm certain she administered her fair share of spankings to children and grandchildren. I know that I had many conversations with her although I can't now recall those conversations. The only specific thing I remember her ever saying to me was when I walked to her house one day to give her a message from my grandmother and when she answered the door she called me “Mechelle” (my cousin). She was in the early stages of Alzheimer's at that time. I didn't know that then. I only knew that she knew me and loved me and if she mistakenly called me Mechelle I was not about to embarrass her by correcting her. I loved to go to her house when I was very young and both she and Mark were alive. Mark loved his cigars and was always smoking one. They were affectionate with us and where Edith was quiet, Mark was very jovial and quite a jokester. I can remember sitting on the couch with both of them sitting alongside me and feeling so safe, so happy, and so loved. If my own grandchildren and great-grandchildren never remember anything else about me, I hope they remember being with me and feeling very safe, very happy, and very loved. My biggest regret in regard to Edith is that when she was put into the nursing home I never went to visit her. Never introduced my children to her. I hope she forgives me. I hope many other things in regard to her- but I'll state those hopes at the end of the post when they will make more sense. In death, Edith has become even more of a treasure to me than in life and this is what I want to focus on for this blog post. In 2012, God chose to call my son home to Heaven. I sometimes privately refer to that day as “the day of my greatest sorrow”. In the aftermath of trying to figure out a way to deal with all the sorrow, I began to look at my female ancestors with a focus on the ones who lost children. I tried to look at what I knew of their lives and see how they worked their way through the pain and how they lived their life after losing a child. One of those female ancestors was Edith. The day of Edith's greatest sorrow was 13 December 1955. Her son passed away at 8:15 that evening. Edith was about 49 years old. I did not know much about her son, C. J., but after my son's death I began to learn about C. J. 's death and my heart broke for Edith. It helped me to put my son's death in perspective and I knew that if she could cope, I could surely cope. C.J. was 18 years old and attending high school in Jay, Delaware County, Oklahoma, at the time of his death. He and some friends and relatives were going to a revival. C. J. was driving near Seneca, Newton County, Missouri, when he missed a curve. The truck rolled, pinning him inside. A witness attempted to rescue him but as the rescuer's hand was on C. J., the gasoline tank blew up and the rescuer was blown away from the truck. C. J. burned to death. It was said that witnesses could hear his screams for help as he was being burned alive. My sweet, loving Edith lived with that knowledge all her life. I cannot even imagine. When Edith was young, she lost one of her younger sisters to death and now her own son was gone. She had a lifetime of loss to cope with. I understand now why Edith was so quiet. I understand now why she was diligent about reading her Bible and praying daily. I have instinctively coped in so many of the same ways that she did and in some way I think she helped me find my way through the very difficult days by the way in which she lived her life. I know in my heart she prayed for me and for each of her children, grandchildren, and great-grandchildren. I know because I pray for mine- present and future. And I know that had she been alive when the day of my greatest sorrow came, she would have wrapped her arms around me, prayed with me, and loved me through it. I love her more because I know that she stored up prayers for me in Heaven and when I needed them, God answered them. A praying Grandmother is God's gift to families. I hope I'm worthy to take up that mantle and carry on the tradition of my grandmothers. I hope I make them proud. I hope I make Edith proud. My final hopes in regard to Edith are this. I hope that when she was devastated by Alzheimer's that one of the things she forgot was the grief and pain of losing C. J.. I hope that at the moment of her death, one of the people on her heavenly welcoming committee was C. J. I hope she is at this moment resting in eternal joy and peace surrounded by the presence of her perfect God and surrounded by the people she loved most and missed most in her lifetime. I hope she is surrounded by eternal, perfect love. 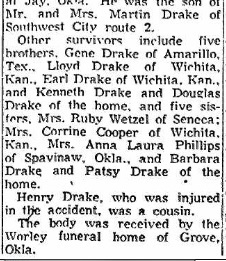 If you are interested, below is a 14 December 1955 Joplin Globe article about the wreck and C. J. 's death. But if you are interested in knowing how she coped with the many losses in her life, pick up a copy of The Holy Bible and read that. Edith's life was affected by this loss, but her life was defined by her faith in God. Don't forget to click on over and read the posts of my blogger chick friends who are doing the 52 Ancestors in 52 Weeks challenge along with me. You can find them at Down in the Root Cellar and Theology for Mom. Lisa, this was such a sweet post. I think I will keep a box of Kleenex with me with for when I read any of your posts! You are such a great writer and I do hope you get the chance to put together a book. Until then I am forever grateful for this blog so that all of those who never knew your ancestors, and especially Ashley and Adam, will be able to glean from you a piece of history and a part of their ancestry. Thank you for your research and the time you spend writing. This verse came to mind, in the way your grandmother's faith helped you during your time of greatest sorrow..... Romans 15:4 (one of the first verses I committed to memory) For everything that was written in the past was written to teach us, so that through the endurance taught in the Scriptures and the encouragement they provide we might have hope. And now her story, and a piece of yours, has been written for future generations to find encouragement and hope.